Nowhere is that more true than on the grand and majestic Mississippi River. And if you’re looking for wonderful places for river play, Lansing, IA is an ideal spot. Offering incredible views of the Ol’ Miss, Lansing is nestled on the river’s edge below limestone bluffs. 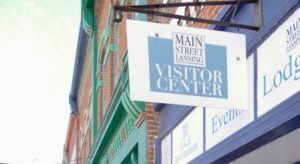 The Lansing area is the ideal spot for all your favorite river activities including canoeing and kayaking, sandbar camping, waterskiing, cruises and fishing. Grab your canoe, paddleboard or kayak and push off into the Reno Bottoms Canoe Trail. Located in the Mississippi River just 15 miles north of Lansing, this 3-14-mile canoe trail is designated as a Refuge Area by the U.S. Fish and Wildlife Service. Drifting through the backwaters among American lotus and water lilies you may encounter river otter, turtles, blue herons, egrets, eagles and muskrats. Tributaries to the Mississippi also offer excellent water opportunities. The Upper Iowa River, 10 miles north of Lansing, presents stunning vistas of palisades and bluffs creating a relaxing float-away experience by canoe, kayak or tube. The Yellow River Water Trail, 15 miles south of Lansing, meanders through 35 miles of hardwood forests, limestone cliffs and large boulders culminating at the Effigy Mounds National Monument. This remote and breathtaking clear-water stream will delight your senses. Ready to tackle the Big River? Lansing locals and visitors alike know that the Mississippi River is an unparalleled place for water fun. You can also leave the driving to someone else by taking advantage of many types of river cruises. Check with Mississippi Explorer Cruises which offers 2-3 hour specialized and seasonal excursions.